Cover article outlining the project published in Issue 71 May/June. Many thanks to VV team and their continuing support in facilitating the twice yearly bulletin and two annual Belvoir High School Newsletters. Thanks to volunteers. (Dave Slater, Will Wiseman, Dave Middleton, Sue Middleton, Joyce Slater, David Bend, Jonathan D’Hooghe, Vic Martin, Neil Fortey, Mary Owen, Malcolm Owen). Received 15 offers of material and we spoke to over 100 people about the project. Acquire a counter clicker for tallying numbers at events! Sue and Dave Middleton represented the project at the rehearsal of this very well attended and performed concert. Liaise with Liz Mills from the Primary School re children’s performing at the Launch meeting in September and contributing to the U£a concert in St Mary’s in the spring of 2015. Exact date contingent on the completion of renovation work to the west end of the St Mary’s. Discussion with Jack Latimer re progress migration to new platform in process: result in easy to use website and integrated catalogue. Thanks for web pages contributions from: Stan Stewart and Geoff Spencer on their grandfathers’ WW1 service. Archive donations to date: Ted Rayson, Mrs Gwen Johnson, Mrs Metcalfe, Mrs B Worley, Mrs G Smith, Mrs G Claricoats. Bill Pinfold cataloguing describing the content the Claricoats collection of 200+ items. Photo montages summairsing material on the website (www.bottesfordhistory.org.uk). Enter items on updated catalogue when available in August/September. Bottesford Primary School has nominated dates for this event in Sept/Oct 2015. Taff Gillingham (Khaki Chums) still to commit to the event. If they are unable to attend additional assistance will be requested from the Leicestershire and Rutland Western Front Association. Thanks to Sue Meech’s effort both going very well and attracting increasing attention, eg., 300+ Twitter followers in 3 months. Some excellent and informative material on WW1 events and projects available via both Twitter and Facebook. Google Drive in development as the place for working documents. Not the perfect medium for collaborative work but useable for our purposes. Acquire and make available War Diaries for Battalions of regiments list on the two war memorials from National Archive if accessible online or from @rcre archive and research and document copying if not online. Notes for War Memorial family histories and service record biographies (Bottesford (29) and Muston (11). 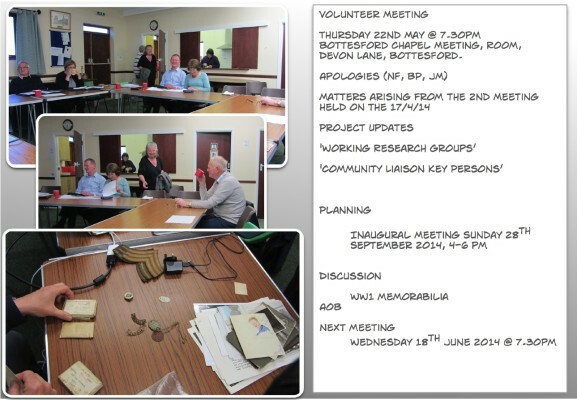 The Bottesford Parish WW1 Project is a partner in this recently launched initiative. We have free access to the service records currently available on the website: https://livesofthefirstworldwar.org. When our research is complete our aim is to enter our research on this site. The site is still in development. Well worth a look. Establish a presence on the Lives of the First World War to demonstrating our interest and the nature of the Bottesford Parish Project. Run a workshop in using the site. The meeting identified that there is need for increasing the access to Ancestry. The local library gives free public access – two terminals available. A Library PIN is needed to log on to the service. Sue Middleton to organise a workshop on the use of Ancestry. Run Ancestry Training and then develop working groups from there. Sports Clubs – Bowls?, Cricket?, Football?, Angling? displays of memorabilia, project activities and interactive online access to web site. Clearly indentify what is expected of invitees eg., whether requested to present or not. Book Bottesford VC Hall from 12-6.00pm 28/9/14. Invite WI to organise refreshments. WW1 memorabilia – Phil and Sue Harding showed just some of their family WW1 memorabilia. Organise scanning of material for inclusion in the Catalogue. From Pit to Trenches: First World War Remembrance – West Hallam Well Dressing Weekend, Saturday July 12th 2014. I am researching a Bottesford First World War Soldier who is named on our local Colliery War Memorial. Private Clifford Miller was the youngest son of John and Mary Miller of 17 High Street Bottesford. He worked for the Mapperley Colliery Company and enlisted for the 11th Battalion Sherwood Foresters at Ilkeston, Derbyshire. Private 17988. Killed in Action 1st July 1916 aged 28. N.K.G. THIEPVAL MEMORIAL Pier and Face 10C, 10D and 11A.The Mapperley Colliery Company War Memorial is situated at the St. Wilfrids Church Gates West Hallam. He is one of 66 men who worked for the company and are listed on the memorial. I would be pleased if you could send any information of any other memorials that shows Clifford Miller name. Our village will remember all the men on Saturday July 12th 2014 From Pit to Trenches: First World War Remembrance/Village Well Dressing Weekend. Relatives and Friends of the named fallen are invited on the afternoon to lay a poppy cross on the Saturday afternoon at 1-40pm. This page was added on 05/06/2014.